Latvia. Lettish people from Lyutsinsky district in 1866. Home » Latvia. 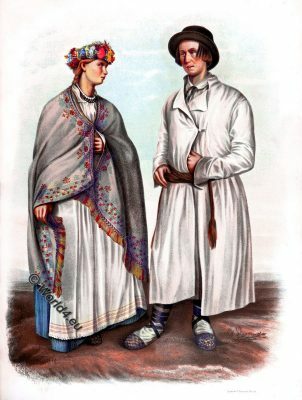 Lettish people from Lyutsinsky district in 1866. Latvia. Lettish people from Lyutsinsky. Latvia. Lettish people from Lyutsinsky district of Vitebsk Provinces. The government of Vitebsk (Russian Витебская губерния / Vitebskaja gubernija) was an administrative unit of the Russian Empire. Today the territory is mostly part of Belarus, the north-western part is to Latvia and the north and east to Russia. Source: Collection of anthropological and ethnographic articles on Russia and the countries adjacent to it, published by Vasily Andreevich Dashkov. Moscow 1866. This entry was posted in 1866, 19th Century, Latvia, Russia and tagged Latvia traditional costume on 8/2/17 by world4.